An intensive inventory is a systematic, detailed field inspection done by, or under the direction of professional architectural historians, historians, archeologists, and/or other appropriate specialists. This type of study is usually required to formulate a preliminary determination of the significance of resources and their eligibility for listing in the NRHP and/or the North Dakota State Historic Sites Registry. It is preceded by adequate literature search (Class I), and, sometimes, by a reconnaissance effort (Class II). 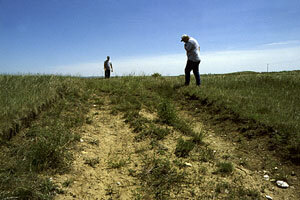 A comprehensive, systematic effort is made to identify all resources within the area of concern that might qualify for the NRHP and/or the North Dakota State Historic Sites Registry, and to record information sufficient to permit their evaluation or to indicate what further work is necessary to accomplish their evaluation. All cultural resources should be evaluated against the criteria established at 36 CFR 60.6 (redesignated 36 CFR 1202), and supporting documentation should be developed with reference to guidelines published as an attachment to interim regulations at 36 CFR 63 (redesignated 36 CFR 1204) in the Federal Register on Wednesday, September 21, 1977, Vol. 42, page 47666. Professional personnel of the HPD are available to consult with other federal, state, and local agencies, or private concerns, about applying these guidelines to particular circumstances.